As Fostering International Peace Lead, one of my objectives is to connect with people and organizations that are doing good around the world. To this end, in my other day job as a United Nations Representative, I have an opportunity to gain a global perspective. Attending meetings, conferences and forums led by delegations from member states, civil society, community leaders, and experts in the field serves as a rich informative environment. 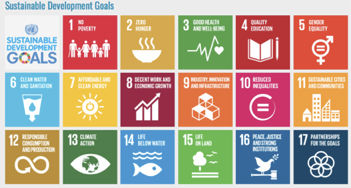 These 17 Sustainable Development Goals that range from no poverty, clean water, and gender equality are a framework for partnership for all citizens of this planet. I will highlight 5 Sustainable Development Goals’s that align closely with the prioritizes of the Peace Alliance’s mission known as the Five Cornerstones of Peacebuilding. The 17 United Nations Sustainable Development Goals and the Peace Alliance Five Cornerstone of Peacebuilding set an ambitious agenda for change and to develop Powerful partnership between individuals, organizations and governments who are adopting shared values and principles that relate to something bigger than ourselves to safeguard a global culture of peace.